Home » Competitions » Win a 2.7m LED Solar Parasol worth £139! 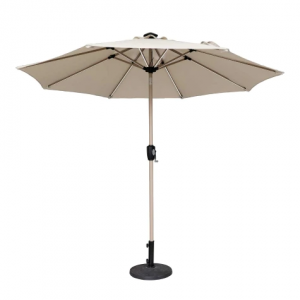 Shelter from the sun on long summer days and then enjoy relaxing into the evening in the same spot thanks to the LED lighting that has been charged throughout the day on this beautiful parasol. Featuring solar powered LED lights, that charge from a panel at the top of the canopy, the 2.7m LED Solar Parasol has three different light settings that let you continue enjoying your garden after the sun sets. Three buttons on the crank box adjust the angle, while the crank and tilt mechanism opens the canopy. A vent at the top allows air flow, releasing excess heat and increasing stability in the wind. Able to be left outside all year, the rust-proof aluminium frame has a waterproof polyester canopy, with UV50+ protection. Attached fabric ties secure the closed parasol. --Please Select--Win a £500 Garden Makeover!Win a 2.7m LED Solar Parasol worth £139! Were there any types of adverts missing that you were in need of? Would you be interested in paying a small monthly fee for an exclusive community hub for One Mag readers where you can receive more articles, exclusive competitions, video content, vouchers for attractions and restaurants, and lots more? Terms & conditions: Deadline for entries is 30/04/19. Entrants must be aged 18 or older. Prize is non-transferable and no cash alternative offered.